I can't really explain it, but the average New York resident seems to be disproportionately more stylish than the residents of any other city across the country. Credit the fashion industry's strong presence or the opportunity for great street style at every turn, but the city is teeming with inspirational style. Short of hopping on the next flight to the East Coast destination to witness for yourself, getting your fill of NYC style is as easy as following some of its best-dressed citizens on Instagram. Since there's a good chance that we all follow the same few fashion bloggers on the platform already, we're branching out and highlighting an inspirational group of women from across the fashion, music, and art worlds. From fine artists and DJs to editors and stylists, each of the following women has a unique approach to personal style that we love to follow and know you will, too. 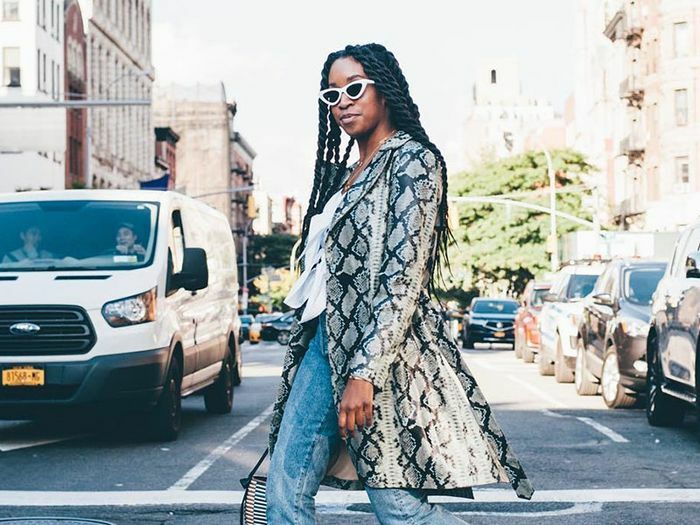 Scroll down to discover nine women with the best non-blogger NYC style and get ready to hit follow. P I N K y & T h e B r a i n ???? ???? Amid a full feed of outfits that tend to look the same, Candace's penchant for bright, bold colors and dramatic silhouettes are what make her outfit shots truly unique. Tevas and sleepwalking but most importantly I styled Tevas for @manrepeller ????????‍♂️????????‍♂️??????? ?‍♂️ (yes I know summer is over) (but just click the link in my bio) (you too can wear Tevas well into fall!) photos by @emilymalan ! Juliana's a regular on the street style scene and has built an impressive résumé at NYC fashion companies from Ganni to Man Repeller. The Miami native has a knack for styling all the It pieces of the moment in an unfussy way. Shearling loafers! For! The! Win! As the designer behind It brand Orseund Iris, Alana naturally fills her personal feed with the brand's latest pieces, but her own style balances her brand's romance with a more grunge-inflected downtown vibe. Sure, you'll start following Chloe for her impressive large-scale paintings and laugh-out-loud humor, but you'll stick around for her vibrant outfits and love for Prada shoes. As a prominent NYC fashion editor, Chrissy shows off her envious wardrobe all over her feed. Though she's often the first to test out the latest trends and new brands, she always does so with her signature sleek, edgy take. You might recognize Imani as one of Glossier's darlings, but she's just as much a fashion girl as she is a beauty girl. She'll be the first one on your feed to try out new and out-there trends, so make her your go-to for cool, cutting-edge style inspiration. Visa renewed ✔️ On my way back ✈️ Shout out to God for always having my back & the universe for letting me love what I do every single day! ???? Emotional caption but I never take living in NYC for granted and I’m just so happy to come back and keep working hard!!! (Pic from one of my fave nights this year - bringing my mum to a gig, one of the first times she’s ever seen me play) ???? The Australia-born DJ has a fun-loving sense of style that's trendy in a way that feels totally separate from what everyone else is wearing. That under-the-radar brand you've started hearing more about? Salem's likely all over it. As Opening Ceremony's brand manager, she gets to test-drive all the cool indie brands, from Area to Adam Selman. Refinery29's creative director is a self-described goth, and her commitment to an all-black aesthetic is admirable. In a sea of maximalists and rainbow colors, Lydia's outfits lend a dose of pared-back style you didn't know you were craving. Next, see which 9 pieces I just added to my wardrobe that I'm over the moon about.